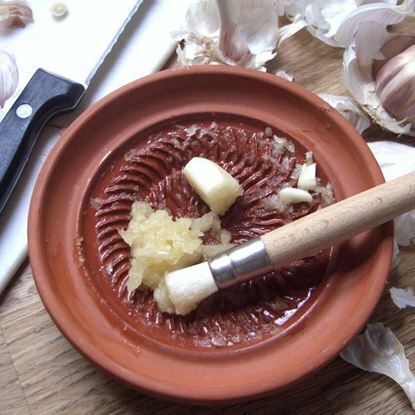 Garlic Graters - For a quick & easy way to create garlic paste! 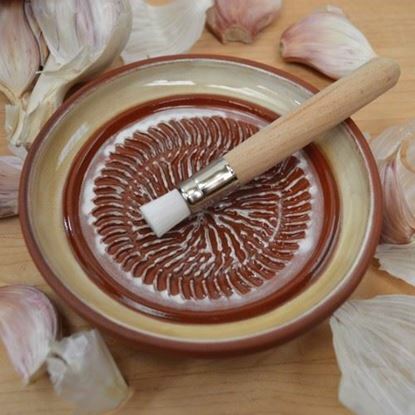 Designed to fit comfortably in the hand this English terracotta garlic grater is quick & easy to use. Simply rub peeled garlic cloves in a circular motion over the textured grating area to quickly turn your garlic cloves in to garlic paste. Easy to clean - simply rinse the garlic grater under the tap after use. Made & hand finished in the UK from durable English terracotta clay. Available with a tailor made brush ideal for removing garlic puree from the grater easily & without waste. Also excellent for lemon zesting, ginger roots & hard cheeses like Parmesan! Quality wooden brush is also UK made! Length 10cm.